In the heart of a city, it is sometimes difficult to remember that somewhere amongst the buildings and the concrete still beats the heart of nature. 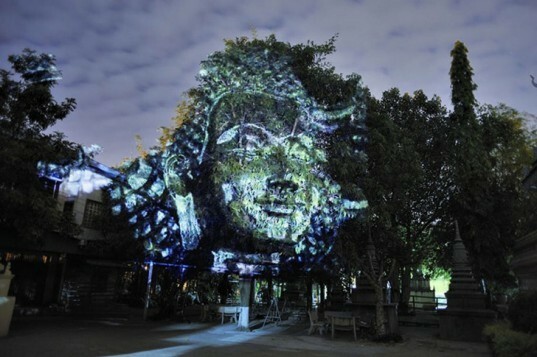 With his digital projections of deities and spirits onto trees in Cambodia, French artist Clement Briend reminds us of centuries-old cultures and traditions amid the tumult urbanization. The Buddhas, demons, and taras that emerge from the branches are illuminated in vibrant colors, making the images appear almost like religious visions. Part installation and part homage to the landscape, each piece is as unique as the canvas on which it appears. French photographer and founder of the Politics Illuminations Group has been projecting and photographing his artwork since 2008. Using the large scale installations as a free expression of public art, he transforms two-dimensional pictures into sculptural pieces. Using technology as a way to represent the past, Briend has created work that taps into symbols of faith and the natural world. He also proves that we can still be amazed by the simple play of light and color on a large scale. There has always been something dazzling about a giant, illuminated picture, and “Cambodian Trees” is no exception. To see more of Briend’s projections throughout the world, head over to his website for a full portfolio. French photographer and founder of the Politics Illuminations Group has been projecting and photographing his artwork since 2008. Using the large scale installations as a free expression of public art, he transforms two-dimensional pictures into sculptural pieces. "It’s a beautiful surprise when the projected spirits awaken and reveal themselves at night as though they are made of the towering trees themselves. The photographic light installations echo the spirituality of the few sprouts of nature in the predominantly urban landscapes. It is a visual imagining of the divine figures that inhabit the world, as seen through an environmentally aware spiritual eye." says Briend. Using technology as a way to represent the past, Briend has created work that taps into symbols of faith and the natural world. He also proves that we can still be amazed by the simple play of light and color on a large scale. 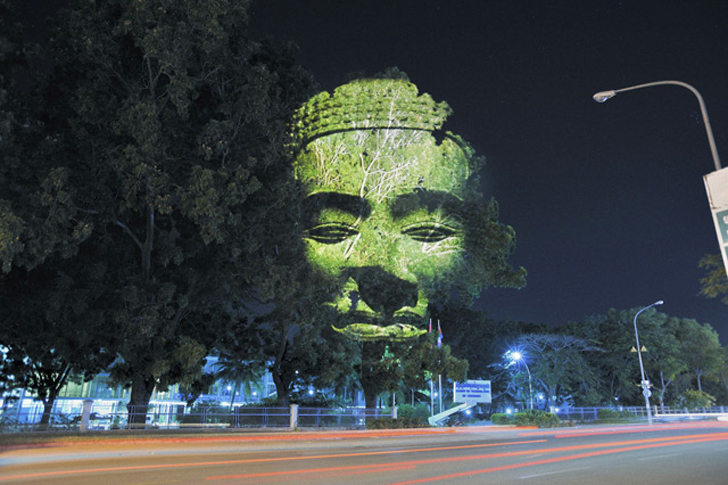 There has always been something dazzling about a giant, illuminated picture, and "Cambodian Trees" is no exception. To see more of Briend's projections throughout the world, head over to his website for a full portfolio.